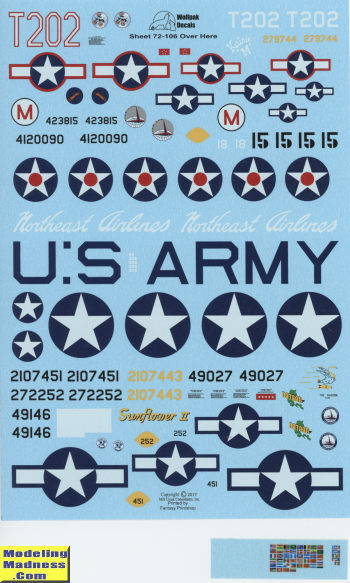 Wolfpak has started a series of WWII subjects and apparently they are doing well enough for more sheets to be produced. This one is neat in that it covers subjects that were either stateside or operating in the Panama Canal zone. First up is an A-25A. This is the Army's version of the SB2C, but it was never used in combat by the Army, instead being operated in secondary duties. This is a target tug from the 3rd TTS flying out of Fort Stewart, GA in 1943. Next is an overall metal P-38L. This plane was flying with the 24th FS out of France Field in the Panama Canal Zone in 1945. Next is a C-532 flying with Northeast Airlines in 1942. One rarely sees markings for early B-17s so it is neat that we have markings for 'The Swoose' when flying out of Albrook Field in the Canal Zone in 1943. Probably the first Presidential aircraft was the Sacred Cow. This VC-54C is offered in two markings options. Note that a special window arrangement is needed to properly portray this plane. 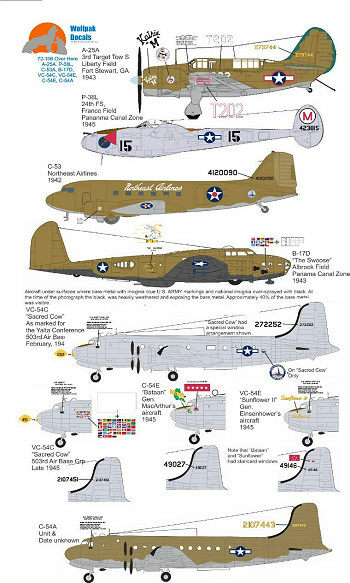 Also included is MacArthur and Eisenhower's personal transports from 1945. Finally, a generic C-54A in OD and grey from an unknown time during the war.